Los Angeles: 1953. Come to the City of Angels! It's the American Dream. Movie stars, orange groves, blue skies, palm trees--even a new "freeway" that'll get you from Downtown to the beach in only twenty minutes! The clean-cut boys in blue of the L.A.P.D. (America's finest!) patrol the streets, keeping away the gangster scum that's turned back East into such a cesspool. Get yourself a nice split-level ranch in the Valley--own a piece of the pie! This Tinsel Town beauty ain't skin-deep.........or is it? For Generation X and aging millennials (we were largely able to attend R-rated flicks without ID in those days), 1997's L.A. 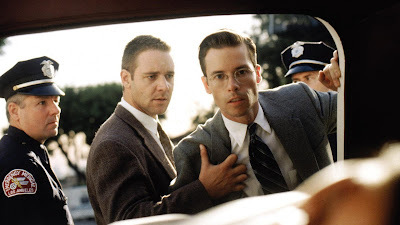 Confidential was our first true introduction to film noir the way Hollywood "used to make it." 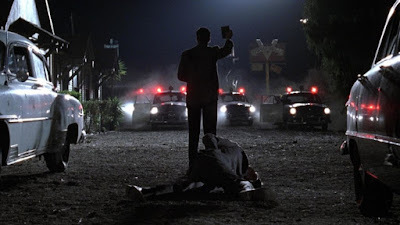 The '80s and '90s produced a veritable treasure trove of neo noir (the Coen Brothers' Blood Simple, Billy Bob Thornton's One False Move), but nothing with the atmospheric authenticity and exacting attention to period detail found here. Brilliantly adapted from James Ellroy's sprawling novel, its serpentine story features plot twists, double crossings, triple crossings, dirty dealings, corrupt cops, beautiful call girls, wanna-be Hollywood stars, and two-bit hucksters galore. While certainly a big-budget mainstream Hollywood production with an all-star cast, L.A. Confidential has a heart so nihilistic and characters so amoral that it feels like dime-store detective pulp fiction from a bygone era. It's not merely a richly atmospheric film noir period piece, however. It's secured its place as one of the finest thrillers and crime films of any era. Officer Bud White (Russell Crowe), a brooding, menacing hulk with a badge, has a soft spot for battered women and isn't afraid to plant evidence or dispense merciless violence to get the job done. Sgt. Ed Exley (Guy Pearce) is a rising star on the force, ambitious and eager to live up to his deceased father's name and reputation, but also a ruthless political animal unafraid to cut corners and step on as many toes as it takes on the way to the top. Sgt. Jack Vincennes (Kevin Spacey, in a supporting role but given top billing fresh off his Oscar win for The Usual Suspects) is a high-profile "celebrity cop," technical consultant on the hit show Badge of Honor, who loves to hobnob with the stars and attend A-list parties. He's also not afraid to take kickbacks for setting up front-page tabloid celebrity arrests with his sleazy cohort Sid Hutchens (Danny DeVito). When a brutal mass murder shakes the city to its core, loyalties are tested and uneasy alliances are formed to bring the perpetrators to justice. The case is supposedly wrapped up with a bow, solved and swept under the rug, but none of it sits well with the aforementioned anti-heroes. All-too-rare crises of conscience stir these men, who clearly despise each other, to work together and get to the bottom of things. If you're a sucker for detective thrillers, you're in for a treat. There are interrogation rooms, county morgues, and record rooms. There's an enigmatic millionaire who may be pulling the strings (David Strathairn), who may or may not be running a ring of call girls altered by plastic surgery to look like movie stars (Kim Basinger shines as "Veronica Lake," and her performance went on to win a well-deserved Oscar). There's nods to true-life crimes from L.A. history, with real-life historical characters peppered into the cast. The men wear hats, and everyone smokes. It's hard to appreciate just how brilliant Brian Helgeland's Oscar-winning adaptation is without having read James Ellroy's original novel. The novel, although intelligent, immersive, and thrilling, is a big sprawling mess. While Ellroy remains my favorite author, this is one hell of a challenging read. It has roughly three times the characters and subplots as the film (I needed to take notes to keep track of everything), and Ellroy (characteristically profane as ever) even said in an interview "this fucker is adaptation-proof." Yet here we have the rare example of a terrific film that's even better than its already great source material. Sadly, L.A. Confidential was buried under the juggernaut that was Titanic's overrated cruise to Oscar victory in 1997. But it remains a film noir masterpiece, and one you don't want to miss.